EC New York language school is recruiting Student Ambassadors! Here is some more information about the program, including qualifications and requirements. Student Ambassadors are passionate about EC and enthusiastic to participate in our unique program which allows them to share their student experiences and familiarization of American culture to new students from all over the world. 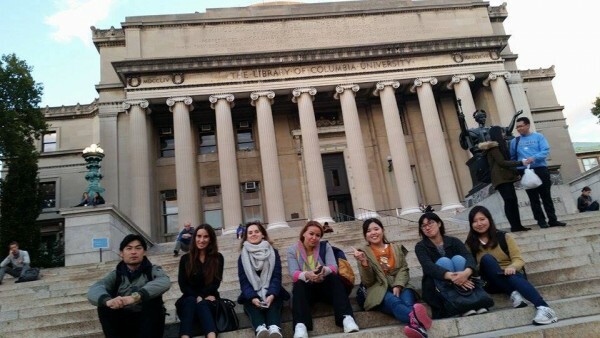 Student Ambassadors are proud of their country, yet have adapted comfortably to life in the New York City. Student Ambassadors will serve a vital role within the EC community through dynamic contributions to assist student services and by sharing peer feedback with EC members of staff. Student Ambassadors come from all over, are curious, open minded, and love New York! Student Ambassadors help out with several aspects of our school, especially including the activity schedule. Students Ambassadors help plan and lead activities of their choice. They also encourage all students to cooperate with EC’s aim to speak English at all times, and provide valuable feedback on restaurants, tourist attractions, and activities considered “student friendly”. These students must write a monthly published blog post, and help with events such as graduation and new student breakfasts. What are the benefits of participating in the Student Ambassador program? Being a Student Ambassador has several benefits. Firstly, this gives you the opportunity to build your resume/CV and work experience with leadership skills in English, in addition to being a published blog writer, in English! Another benefit is that you receive reimbursement for any ticket/entry costs for your activities. (This means you get to enjoy free events throughout the city!) Lastly, you will receive an authorized Letter of Recommendation from our Center Director to give you a competitive edge when applying for universities and jobs. If you are interested in applying, visit Emily in the academic office for more information.